New York, New York and Crofton, Maryland, June 30, 2010 – Frank MacKay, Chairman of the Independence Party of America (IPA), today announced his endorsement of Brian Murphy, Republican Candidate for Governor of Maryland. The IPA is America’s voice of independence, with more than 412,000 members in the New York affiliate alone. The IPA focuses primarily on fiscal responsibility, and does not take a stand on social issues. “The American people are tired of incumbents. They want new voices. We have been watching the events in Maryland with great interest. Murphy is an independent voice, and I believe he has the vision, leadership and experience to take Maryland forward,” said MacKay. Because of Maryland’s large percentage of independent voters, the IPA has been looking for an entryway into Maryland. While the IPA traditionally backs Independent candidates, it is backing Murphy for Governor because his fiscally conservative principles are those valued by the IPA. “Murphy is the best candidate to win in November and to fix Maryland. He has a proven track record: as an economist, he helped build and lead Maryland’s premium multi-billion dollar company. In doing so, he built a reputation as one of the nation’s premiere risk managers. There is no one with a better understanding of how to fix Maryland’s economic woes, create jobs and balance the State’s budget than Murphy. This is why I will put all my weight and support behind him,” said MacKay. Brian Murphy is a successful Maryland businessman with a BA in Economics from the University of Maryland and an MBA from the University of Pennsylvania’s Wharton School. He is founder of the Plimhimmon Group, whose first investment, the Smith Island Baking Company, has been featured in The Washington Post, the Wharton Magazine, the Baltimore Sun, Businessweek and other publications for its principled approach to job creation in Maryland. Monday, June 28, 2010, was a landmark day for liberty—but not in the way that most conservatives realize. News outlets led with stories of the Supreme Court’s gun rights ruling in McDonald v. Chicago (Matt Drudge even announced the ruling with one of his famous “siren” graphics) and then quickly shifted their attention to Elena Kagan’s confirmation hearing. Lost in the shuffle was a second Supreme Court decision, one that contains a line of reasoning that threatens our understanding of what liberty is. That case, Christian Legal Society v. Martinez, dealt with a seemingly simple issue: Could a university require a Christian student organization to open its leadership and voting membership to those who disagree with the group’s faith or who refuse to abide by its code of conduct? In other words, could the university require a Christian group to be led by Muslims or by people who disregard biblical commands regarding, for example, sexual behavior. Common sense would dictate that a group should be able to limit its membership and leadership to those who share the group’s purpose. After all, who ever heard of a Republican group led by Democrats, an African-American group led by white supremacists, or a vegetarian group led by cattle ranchers? But this involved a university, where common sense is always trumped by political correctness, and this particular school (Hastings College of Law in San Francisco) said that each student group had to open its membership and leadership to every student on campus. This “all comers” policy destroys freedom of association—the constitutional liberty to form a group around a shared purpose—and the Christian Legal Society sued to protects its rights. After a long and winding litigation road, the case reached the Supreme Court, and on Monday the court ruled against the Christian group. The 5-4 decision was written by Justice Ginsburg and was joined by Justices Sotomayor and Breyer. Justices Stevens and Kennedy filing concurring opinions. Justice Alito filed a dissenting opinion, joined by Chief Justice Roberts and Justices Scalia and Thomas. Put in plain English, the court is allowing the university to put in place a policy that destroys the free-association right of all student groups, then is accusing the one group with the courage to challenge that action of seeking a “preferential exemption.” Since when did the defense of longstanding constitutional rights become a quest for special treatment? Not only is the court’s decision to equate the defense of fundamental rights with a quest for “special rights” legally suspect, it has a pernicious effect in the public square. Many Americans—especially conservatives—are outraged when groups seek special favors or special exemptions from generally applicable laws. To cast the Christian Legal Society in that light brings automatic suspicion to their claims. The bottom line is that the government—whether acting through Congress or through a university administration—should not have the power to regulate away our fundamental rights. And those groups courageous to stand against such a power grab are defending liberty, not seeking special status. The Arlington, Mass., school committee has rejected the 17-year-old’s request to allow students to voluntarily recite the Pledge of Allegiance, because some educators are concerned that it would be hard to find teachers willing to recite it, according to a report in the Arlington Patch. “Patriotism is a very personal thing for all of us, but I do not think it is in the school committee’s best interest to mandate that any of our employees recite the pledge,” she told the Patch. “If we can’t find one teacher who is willing to say the pledge, then the system we have is cracked,” he told FOX News Radio, noting that a number of teachers signed his petition. Arlington’s superintendent of schools did not return a call for comment. Rep. Stark Mocks Border Security Advocates: Who Are You Going to Kill Today? A California congressman known for edgy sarcasm mocked an opponent of illegal immigration during a town hall meeting last week, asking, “Who are you going to kill today?” before the constituent, a self-identified Minuteman, posed his question. Rep. Pete Stark, D-Calif., no stranger to controversy, mocked the idea that the borders are not secure when asked about the federal government’s lack of activity on border security. “We can’t get enough Minutemen armed. We’d like to get all the Minutemen armed so they can stop shooting people here,” Stark said. Eventually, members of the audience urged Stark to offer a serious answer. “If you knew anything about our borders, you would know that’s not the case. Our borders are quite secure, thank you,” Stark said, drawing jeers. Stark resumed his hostile act, asking the Minuteman what he would do to secure the border. “I would send about about 25,000 troops for one thing and build a wall down so vehicles could not pass,” the Minuteman said. “How high and long would it be?” Stark asked. “As high and as long as it takes,” the Minuteman said, elicting cheers. Stark said he would start a ladder company with the Minuteman if he designed the wall and doesn’t shoot the people coming over. “But I’ve got to know how high the wall is and I’ll sell a whole lot of ladders for people who want to come,” Stark said. “This is a very serious matter and you’re sitting there making fun of it,” the Minuteman responded. “I don’t have to make fun of you sir, you do a fine job all by yourself,” Stark said. Stark made the comments last week at a town hall audience that included Steve Kemp, a member of the Golden State Minutemen, a group that opposes illegal immigrants. Kemp recorded the confrontation. A spokesman for Stark did not return voicemail messages left at his office or on his cell phone. He also didn’t respond to an e-mail seeking comment. The clash came as the national spotlight focuses on Arizona’s tough new law cracking down on illegal immigrants and the protests it is drawing across the country, including a legal challenge from the federal government. Immigration is shaping up to be among the critical election-year issues as Republicans try to regain control of both chambers in Congress riding a wave of anti-Washington sentiment. Stark, a liberal Democrat, is expected to easily win re-election against a lightly regarded opponent, political newcomer Justin Jelincic, who describes himself as a conservative Democrat. Stark earned his primary challenge after he slammed a constituent who voiced his opposition to Obama’s health care plan last summer at a town hall meeting. “Mr. Congressman, don’t pee on my leg and tell me it’s raining,” the constituent told Stark, referring to what he called the smoke and mirrors of the president’s plan. In March, Stark seized control of the powerful House Ways and Means Committee for one day after Rep. Charlie Rangel, D-N.Y., stepped aside due to an ethics probe. But Stark was quickly pushed aside in favor of Rep. Sander Levin, D-Mich., after many Democrats privately complained that Stark was too volatile to lead such an important committee. Stark is known for making inflammatory comments. Author AKA John GaltPosted on June 30, 2010 Categories America, Goverment Idiots, Government Corruption, Government Fraud, ICE, Illegal Drugs, ImmigrationTags border security, Freedom, Government Lies, illegal immigration, Individualism, minutemen, pete stark, ViolenceLeave a comment on Rep. Stark Mocks Border Security Advocates: Who Are You Going to Kill Today? Patients receiving dental work at a Missouri VA hospital may have been exposed to potentially life-threatening diseases. (CNN) — A Missouri VA hospital is under fire because it may have exposed more than 1,800 veterans to life-threatening diseases such as hepatitis and HIV. 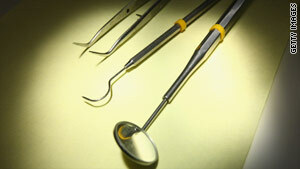 The issue stems from a failure to clean dental instruments properly, the hospital told CNN affiliate KSDK. Dr. Gina Michael, the association chief of staff at the hospital, told the affiliate that some dental technicians broke protocol by handwashing tools before putting them in cleaning machines. The instruments were supposed to only be put in the cleaning machines, Michael said. The hospital has set up a special clinic and education centers to help patients who may have been infected. However, Carnahan said he feels more should be done and those responsible should be disciplined. In June, Palomar Hospital in San Diego, California, has sent certified letters to 3,400 patients who underwent colonoscopy and other similar procedures, informing the patients that there may be a potential of infection from items used and reused in the procedures. CAN THE GOV’T TELL YOU WHAT TO EAT? Author AKA John GaltPosted on June 30, 2010 Categories Goverment Idiots, Government Corruption, Government Fraud, Supreme CourtTags Elena Kagan, Kagan, Patriotic Resistance, politics, Supreme Court1 Comment on CAN THE GOV’T TELL YOU WHAT TO EAT? We have learned from the sordid saga of former Gov. Rod Blagojevich of Illinois of the lengths to which some people will go for an appointment to the United States Senate. Apparently, it’s not all that different for Blago’s fellow Democrats in Washington, D.C. when the prize is a federal judgeship. How else to explain President Obama’s nomination of Jack McConnell, a Rhode Island trial lawyer, for the federal district court in his state. McConnell made his fortune at the Motley Rice class-action law firm litigating asbestos, tobacco, and lead paint cases. Since 1993, he and his wife have contributed $694,000 to Democrats. Among the beneficiaries of this campaign largesse were Obama, four members of the Senate Judiciary Committee that approved his nomination, and the Democratic Senatorial Campaign Committee. All 12 Democrats on the panel voted yes on McConnell’s nomination. Have other judicial nominee been so generous to politicians?For comparison purposes, only four of President George W. Bush’s 261 district court appointments contributed more than $20,000 in their entire political careers prior to their nomination, according to Federal Election Commission data. The most generous of those, a former county GOP chairman, gave $83,000 before he was appointed. By the way, McConnell’s law firm also previously kicked in another $7,700 to Sen. Lindsey Graham, R-S.C., the lone Republican voting in his favor. That only one member of the GOP was involved should surprise no one. The trial lawyers’ chief Washington voice is the American Association for Justice, dubbed a “Heavy Hitter” by OpenSecrets.org. The AAJ has given more than $31 million in federal campaign contributions in the last 20 years, 91 percent of which went to Democrats. Sen. Sheldon Whitehouse, D-R.I., who voted for his home-state nominee, has a long relationship with McConnell that includes a history of generous campaign contributions. When Whitehouse was Rhode Island’s attorney general, he awarded McConnell’s firm a lucrative contingency-fee contract to sue lead paint manufacturers on behalf of the state.McConnell pursued the case using an unorthodox theory. In 2006, he sold a judge and then a jury on the idea that lead paint is not just a dangerous product but also a “public nuisance,” and that companies that once manufactured it must therefore pay for its abatement everywhere in Rhode Island.Can you imagine the costs — and more importantly, the size of the contingency fee? When the state Supreme Court unanimously slapped down McConnell’s theory, it delivered a welcome dose of common sense. Unfortunately, common sense is rare in the nation’s capital and it will become less so if more men like McConnell are allowed to advance the agenda of the Democratic Party and the class-action trial lawyers’ bar from the federal bench.